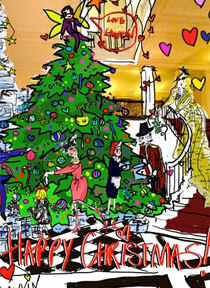 For the past two years, John Galliano’s had the honor of decorating the Christmas tree at Claridge’s. The storied British hotel goes all out for the holiday season, starting with their whimsical, themed tree. This year, with Galliano out of the question, they’re turning to Lanvin’s Alber Elbaz. The designer’s sketch, at the top, shows a characteristically fun, colorful scheme and WWD reports that it will be “decorated with marionettes wearing Elbaz’s take on Claridge’s staff uniforms.” The tree will be unveiled on November 22nd. Meanwhile, Betsey Johnson’s doing the honors stateside, decorating the tree at the Plaza hotel. She’s paying tribute to Eloise with pink tinsel, garlands made of marabou and, in place of a star, an Eloise doll on top. The Plaza’s tree will be revealed on November 28th.